In an Early Day Motion submitted to the UK Parliament has called the BBC to account for its appalling reporting of the C14 terror group that have given legitimacy to its campaign of hate crimes. Ukraine Solidarity Campaign has never joined Putin propaganda with it’s hysterical and exaggerated reports of Ukraine being run by a ‘fascist Junta’ – but that does not mean the far right is not a serious and violent problem in Ukraine. Ukraine Solidarity Campaign appeals to our affiliates and supporters to lobby MPs to support the Early Day Motion. The shocking actions of the BBC would not be tolerated when reporting events in any other Western country. Recently they reported on the arrest of a member of the English far-right group, National Action, charged with encouragement to commit murder. 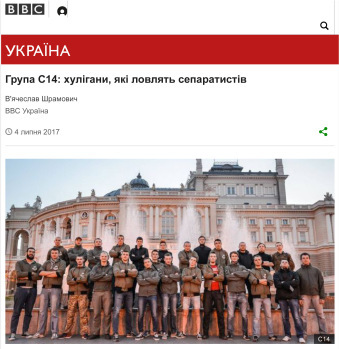 Yet C14 in Ukraine are exactly the same but given encouragement by the BBC reporting which they are openly citing as justifying their activities. C14 are openly targeting individuals on social media and being given open publicity as if their violence is a legitimate political activity. Recently the social activist and young historian Maksym Kazakov was targeted by the leader of the terrorist group Yevgeny Karas on Ukraine’s popular news site Censor Net the account was a call to violence and based on lies and distortions. Maksym was himself active during the EuroMaidan and previously the Orange Revolution. On October 27, Yevhen Karas, leader of C14, gave an interview for Hromadske Radio. The very fact of hosting in a TV studio a far right militant, who after several months spent in the zone of anti-terrorist operation pushed the “fight against separatism” forward into the rear, is appalling. I have posted a comment on the Facebook page of Hromadske Radio, pointing to the meaning of “14” in the name of this organization (the so-called 14 words of the American neo-Nazi David Lane “We must secure the existence of our people and a future for white children” – the international slogan of the white nationalists and supremacists). Karas responded with hysterical comments, involving threats and intimidation. Literally, in a couple of hours he wrote a libel about me, which he published in his blog on Censor.net.ua, Ukraine’s popular news site. Since C14 poses itself as a fighter for the independence and integrity of Ukraine, Karas tried to portray me as an enemy of Ukrainian statehood. However, Karas found it hard to establish evidence-based arguments simply because they do not exist. I began my political activism when graduating from school in Donbas, eastern Ukraine. I supported Yushchenko during the Orange Revolution in 2004, while the eastern part of the country majorly strongly opposed this politician. I was an active participant of EuroMaidan, and my actions were motivated by all-democratic reasons. Trying to portray me as a separatist, Karas has pieced lies with facts together; it would not cause resentment to anyone except the extreme nationalists. after all, some of my Facebook friends live on the occupied territories (Donetsk People’s Republic). In the end, Karas wrote poorly disguised calls for physical violence against me. His arguments are simply ridiculous, but the C14 audience is rather uncritical and radical in its actions, so this text might be perceived as a call to action. I suppose that before writing this libel, Yevhen Karas has not read any of my articles on the history of Ukraine, which are publicly accessible through the Internet. After you read my articles, you will understand that I do not share either Soviet or nationalist ideological constructions. I deal with the issues of historiography, Orthodox brotherhoods of the late nineteenth and early twentieth centuries, the history of the Ukrainian SSR in 1920-1930, and I work as a volunteer editor of “Commons,” Ukraine’s Socialist magazine. Previous Is BBC Posting Fake News on Ukrainian History?